Well, there has been non-stop action the past couple of weeks. 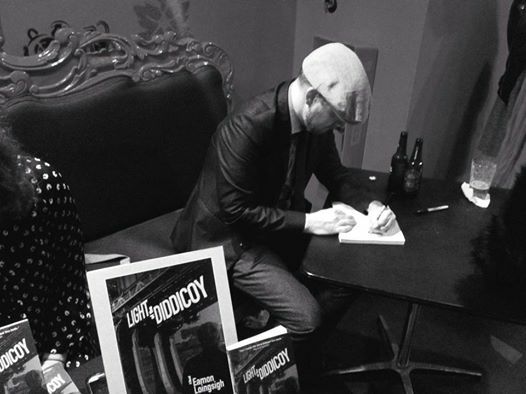 Light of the Diddicoy has been released to the public and we are getting feedback from people all over the country receiving their pre-ordered copies from Amazon and Barnes & Noble. On March 25, all e-books and Kindle versions will be out as well. Bookstores everywhere are carrying it too. Here in New York City, copies have been placed “face out” in the front of huge bookstores like The Strand, McNally Jackson, Book Court and Spoonbill & Sugartown. Barnes & Noble, Books-A-Million and other national chains are carrying it in your neighborhood too and even atMoe’s Bookstore in Berkeley, California and Seattle, Michigan and all over the Mid-Atlantic. This copy (right) just arrived at Tracy & Keith Kellogg-Brodeur’s home in Wilmington, NC. Sales have been impressive for a book whose author does not have an established name (yet!). All over the country we are hearing that copies are being bought. If you have been following the progress of Light of the Diddicoy for a while, now is the time to consider spending a bit (less than $16 everywhere) to get your copy. It does not take long and the links on this page will take you right there. Go to your local bookstore and support them and if they don’t have it, ask them to order for you. I don’t enjoy this side of the business, asking for you to go to the store and buy a copy of the book, so I won’t spend much time doing it. But, the hour has arrived. Please, if you would, consider reaching out for a copy. Do it. Thank you. I was lucky enough to have taken part in the St. Patrick’s Day Parade as we all braved the cold weather. Tuesday night, I had the pleasure of reading at the Irish American Writers & Artists Inc. Salon at The Cell Theatre. As a member, I was very excited to meet some pretty wonderful people. Larry Kirwin, lead singer of the Irish trad-rock band Black 47 and an officer in the IAW&A was there the night after performing on the Tonight Show With Jimmy Fallon! Mr. Kirwin gave a rousing and supportive speech. Also in attendance was Honor Molloy, the playwright and author of the award winning book Smarty Girl: Dublin Savage. Recent book deals from Carmel Harrington and Kathleen Donohoe show that the Irish are still a very valued ethnic writing group. The 2014 St. Patrick’s Day Parade from the corner of 5th Avenue and 44th Street. 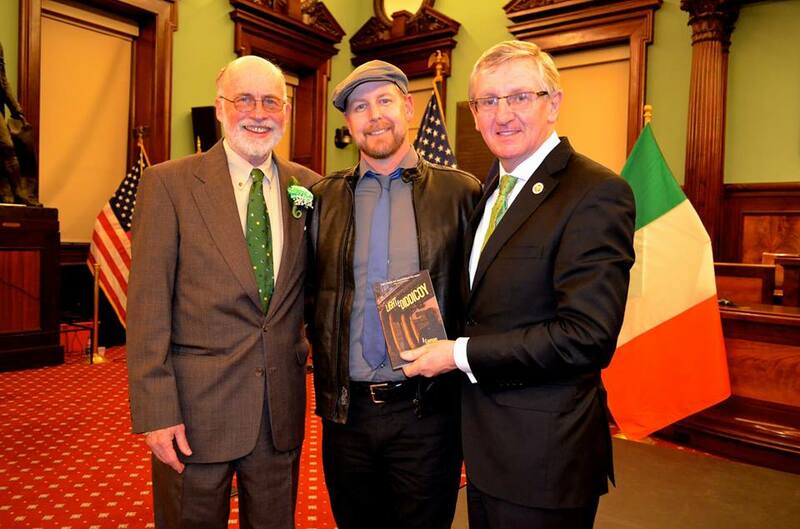 The next night, I was lucky enough to attend the Irish Heritage and Culture bash at City Hall in New York City. Two great Irishmen were honored that night and I was lucky enough to have shared the stage with them, if only for a moment. The proceedings were handled with such care and grace that one has to remember that the Irish hold a very dear place in the heart of all New Yorkers. Especially this time of year! St. Patrick’s Day was celebrated with music, dance and corn beef, cabbage and, of course, potatoes. After that, I jumped on the train for a reading of Light of the Diddicoy atJimmy’s No. 43, a hip spot for poets and authors on the Lower East Side of the city at the Guerrilla Lit Reading Series. I can tell I am getting better at my readings. Not only from the reaction of the crowds, but for the fact that I don’t really get nervous any longer! I always try to make my reading as entertaining as possible (I mean let’s face it, readings can be boring), so I read from Chapter 6, which was about an Irish “tenement wake” in Brooklyn circa 1915. The crowd listened intently as I read and I actually got some “oohs” and “aaacchhhs!” when I read the part about the dead gangster boy’s mother drinking his blood. It was great!!! film crew (doing a documentary on me) will be following. First we are at the famous Irish bar Rocky Sullivan’s where I will be doing a live broadcast for WBAI Radio-NYC with host John McDonough. Afterward we will go to the gang’s headquarters in Irishtown at 25 Bridge Street, then over to the Empire Stores between the Bridges. Finally, we will be selling books at Spoonbill & Sugartown bookstore in Williamsburg. It should be a blast and hopefully we’ll sell loads of books. 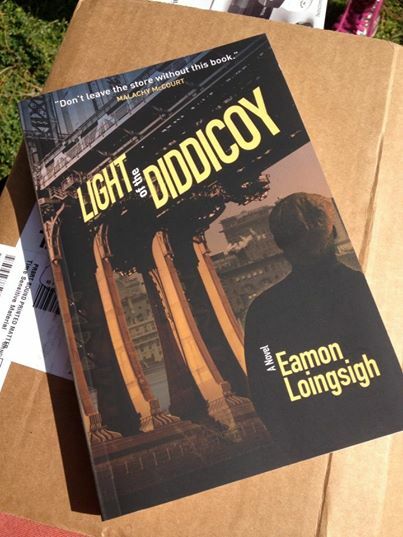 Again though, if you would, go to your local bookstore and order a copy of Light of the Diddicoy. If they don’t have it, ask them to order it. Otherwise, use the links below to order online. Now is the time!